For many homes, having a printer can be extremely useful. From printing out documents and your children's homework, creating your own Christmas cards and posters or printing your holiday photos, there's plenty of reasons why you'd want a printer for the home. When you're looking for the best home printer for your needs there are a number of things you need to take into account. First of all, there's size. Unlike business printers, you don't want a big, bulky, printer taking up huge amounts of room. Because you won't need a printer that has all the features a business printer has, nor does it need to handle large amounts of printouts throughout the day, your home printer can be more compact. There are all-in-one printers that are geared towards the home, and they are a good choice if you need a photocopier and a scanner as well as a printer in your house. If you're after a printer to mainly print out photographs, then there are specially-designed printers that excel at that. Here you'll find the very top models of printers, be they for the home or the office. This list is constantly updated, so you'll get top advice for buying the best printer for your needs. No matter what type of home printer you're after, we have one for you, and our price comparison tool makes sure you get the best deals on the printer of your choice as well. 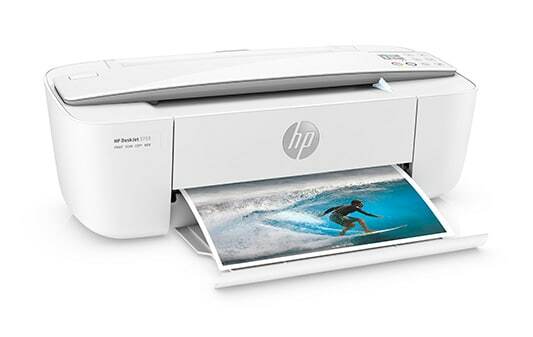 The Deskjet 3630 is our pick for the best home printer. It has decent print quality, a competitive price, and it can connect to mobile devices, which reflects the modern home, where more people are likely to use a smartphone or tablet than a laptop or desktop PC. It doesn't quite have the build quality of HP's more expensive Envy models, but if you're looking for an initially cheap model that catches the eye when sat on a shelf, the Deskjet 3630 is a great option. The Canon Pixma TS8050 is a fantastic home printer for people who just need a small printer for occasional use, printing photos or using the scanner function. It's a bit pricey to buy - and to run - but the flexibility and quality of the printouts is excellent. The fact that it can sit unobtrusively in your house makes it an excellent choice for home users. Consumables are usually expensive when it comes to printers. So it is quite surprising that one vendor, Epson, single-handedly decided to challenge that status quo by allowing users to refill their printer using ink bottles. What's even more surprising is that Epson includes two years of ink with the package; no more expensive cartridges and instead, you have enough material to deliver 11,000 pages worth of black and colour inks (that's 700ml worth of liquid). So, if you have a house that needs to print off lots of documents (such as for school projects), then the Epson EcoTank ET-4550 could end up saving you money in the long run.